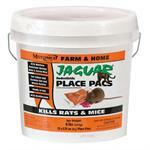 Jaguar All-Weather Bait Chunx are effective in killing Warfarin-esistant Norway rats and house mice. After one feeding, Jaguar Bait Chunx works in 4-5 days after treatment. 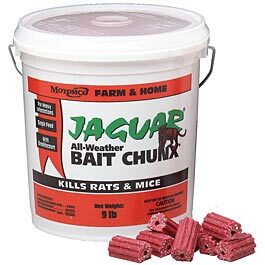 Brodifacoum is the active ingredient in Jaguar All-Weather Bait Chunx. 9LB pail contains approximately 40, 20-gram blocks.